Dow Jones Industrial Average News, 4/19/2016: Global markets pushed even higher on Tuesday as oil prices stabilized. Despite news that Saudi Arabia and a large number of other crude producers couldn't reach a deal to freeze output, crude received an unexpected bounce from an unlikely source. Oil workers in Kuwait have gone on strike, and the pressure from the shutdown has sidelined roughly 1.5 million barrels of crude. This represents more than half of the nation's daily production levels. But don't expect this strike to last very long. Like every other nation in the region, Kuwait depends significantly on oil production in order to finance its government operations. We'll explain how to prepare for what happens next below. Here's today's top stock market news, stocks to watch, ways to profit, and economic calendar for April 19, 2016. Dow Jones futures projected a 53-point gain on the backs of a solid rally from European stocks and the Nikkei. European shares hit a three-month high as oil prices stabilized due to the Kuwait oil strike. Here's a breakdown of why the Dow is climbing higher this morning. First up, this is an extremely busy day of earnings reports. Despite lowered expectations for S&P 500 companies to release their worst quarterly figures since 2009, the Dow just rallied above 18,000 for the first time since July 2015. 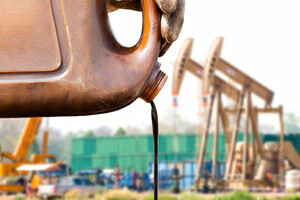 WTI crude oil prices were up more than 1%, while Brent crude also ticked up more than 1.2%. The Kuwait oil strike is supporting prices right now after the collapse of the Doha oil talks. However, one shouldn't expect this strike to last too long given the sector's importance to the broader Kuwaiti economy. Investors may want to prepare for another bout of oversupply. That's because the collapse of the Doha oil talks means that each of the countries that participated – like Saudi Arabia and Russia – will shift their focus back to their own self-interest. Russia has already said it plans to increase production. This will help fuel a daily oversupply level in excess of 1 million barrels higher than global demand, leaving the international markets awash in crude oil. On the economic front, a light economic calendar features the monthly update on domestic housing starts. We might see a slight decline in housing starts, but permits are likely to gain more attention. A rise in permits would indicate future activity and could help offer a boost to the housing market's recent cool down. It's a market of ever-shrinking expectations for the financial sector. This morning, Goldman Sachs Group Inc. (NYSE: GS) beat first-quarter profit expectations, but revenue levels collapsed by 40% compared to the same time last year. Goldman has experienced four consecutive quarterly profit declines as its investment banking and bond trading have faced greater volatility in the markets. We're still keeping our eye on Yahoo! Inc. (Nasdaq: YHOO) and the self-imposed deadline it set for companies to offer competitive bids. Yahoo's assets apparently are all up for grabs, which would include its Internet business, its stake in Alibaba Group Holding Ltd. (NYSE: BABA), and Yahoo Japan. Although 40 companies looked at Yahoo's books, it's not clear that much interest had been generated. According to various reports, Yahoo received bids from Yellow Pages owner YP Holdings, private-equity giant TPG, and Verizon Communications Inc. (NYSE: VZ). Look for the Johnson & Johnson (NYSE: JNJ) stock price to hit a record high at the open of the markets after the consumer goods maker beat expectations and boosted its 2016 earnings outlook. JNJ stock was up more than 1% after reporting strong demand for its pharmaceutical goods. The company did say that a strong U.S. dollar and exposure to weak economic activity in Venezuela tempered its full potential over the last three months.